Condensation is the process of removing water from the air. Condensation occurs any time moist warm air contacts a cold surface. For example, the beads of water that drip down the outside of a cold glass of iced tea in the summertime are a product of condensation. In winter, the fog that forms inside your car windows before the defroster gets going is also condensation from the moisture in your breath. In your home, condensation may appear as “Jack Frost” around the edges of your windows, caused by the moist air contacting the cold surface. “Problem” condensation is EXCESSIVE condensation. The kind that causes enough frost or fog to block whole windows. It causes water to run off the windows … staining woodwork and damaging the wallpaper or plaster. 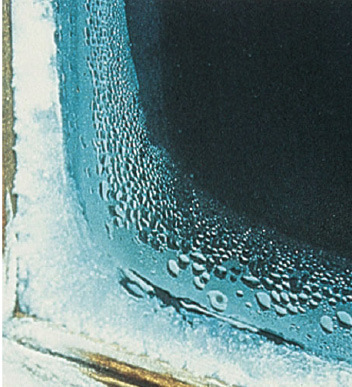 If you have this kind of condensation on your windows, you have good reason to worry. It’s natural to blame your windows … but you shouldn’t. Windows don’t cause problem condensation. They only warn you that you have it. HOWEVER, insulated glass units in quality windows will help to minimize condensation from forming on the glass. The cause of problem condensation is EXCESS HUMIDITY inside your home. It’s the same as water vapor … too much water vapor. It may be freezing in the insulation in your attic where it will melt and damage your plaster exactly like a roof leak when warm weather comes. Or it may be forcing its way out through the siding to form blisters under your exterior paint. That means the most expensive kind of paint job. Humidity, water vapor, moisture, steam … they’re all the same. They are all water in the form of invisible gas in the air. And they can be present in varying quantities in the air. If you have problem condensation, you should follow the six steps mentioned above and/or ask a heating/ventilating/air conditioning professional to review your situation. Replace old worn out windows with insulated glass. This will better insulate your windows from the outside cold air. Moist air must contact a cold surface in order to condense. By installing windows that maintain a warmer indoor surface you will minimize the amount of moist air that condenses on them. ALL Keystone windows have insulated glass packages to help minimize condensation on the inner surface of your windows. To learn more about how they help minimize condensation, contact Rob Mato personally, owner of Keystone Window of Pennsylvania. Be sure that louvers in the attic or basement crawl spaces are open and that they are large enough to allow for the transfer of moist air. Trapped humidity in your attic or crawl spaces spells trouble in the form of mold, plaster and wood damage, as well as window condensation. Run your kitchen or other ventilating fans longer and more often than has been your custom. Shut off your furnace humidifier and any other humidifying devices in your home. The process of heating your home will reduce the relative humidity…providing it’s DRY HEAT. This alone will counterbalance most or all of the moisture produced by modern living. Open your fireplace damper to allow for easier escape of moisture. A dehumidifier can help reduce interior condensation. If you don’t have a dehumidifier, air out your house for a few minutes each day. Air out your kitchen, laundry, and bathrooms during use or just following their use. If these common remedies don’t work, the condensation problem should be looked at by a heating contractor. He may suggest an outside air intake for your furnace, venting of gas burning heaters and appliances, or installation of ventilating fans. These inexpensive options will be less costly than a major painting job or plaster work caused by excess water vapor.